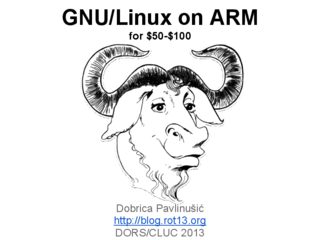 Last week we had another annual conference about Free Software and Open Source DORS/CLUC 2013. For a last year, I was playing with various hardware, so this year, I was part of Internet of things panel (talking about ARM based machines), and I had lecture about GNU/Linux on ARM devices for $50-$100. Dalibor make great presentation about antenna design, including practical examples for ADS-B and 443.92 antenna (simple one from coax cable and one with RF filter for PiHAT) while I tried to explain why RTL-SDR DVB-T sticks made it possible to listen to various your IMS sensors using rtl_443. Next, Filip again took stage to speak about Open Hardware and possibilities to manufacture and sell such devices based on expirience of Dangerous Prototypes cooperation with Seeed Studio. In last part of our workshop we played with blinkm, took questions and discussed other Dangerous Prototypes projects which we had with us which included USB Infrared Toy, Bus Blaster and Open Bench Logic Sniffer but we also talked and showed Arduino and Mojo FPGA board which we had us also to ZPUino which is interesting combination of Papilio FPGA and Arduino IDE. Lovro did a nice overview of FPGAs and how are they different from software programming.